Turmeric is one spice jenih which are found in Indonesia. Usually turmeric is often used as one of the spices. However, it turns turmeric can be used as an herbal remedy believed to cure several diseases. How to cure: Take 3 rhizome of turmeric, 1/2 teaspoon salt. Then boiled with 1 liter of water until boiling, then filtered. after it was taken 2 times a week 1/2 cup. How: Prepare 2 rhizome turmeric, 1 hump sere, 1 sheet bitter leaf. Then all the ingredients finely and squeezed to take water, then add 1 cup of the cooking water is still warm, and filtered. Drunk, and performed for 1 week in a row. Or take one of the simplest grated turmeric, then squeeze without diberri water, then water was added honey turmeric juice mix well. Then drink 2 times a day every morning and afternoon. How to take 1-2 turmeric rhizome, gambier and whiting to taste. Then all the material is boiled with 2 cups water to boil down to 1 cup and then filtered. Drunk and repeated until healed. Way to take one for 4 cm turmeric, 1 by 4 cm ginger, 1/2 rhizome kencur 4 cm. Then all the material is washed and shredded to take water, then add the lime juice, brewed with 1/2 cup hot water and filtered. Can also added salt and sugar to taste and drink on the first day of menstruation. or maybe honey. How one until finely ground turmeric: applied as a compress around each breast 1 time every 2 days. How 2 rhizome turmeric, 1 handful of leaves eceng, then pounded until smooth. After it is applied to the taxable part waterproken. 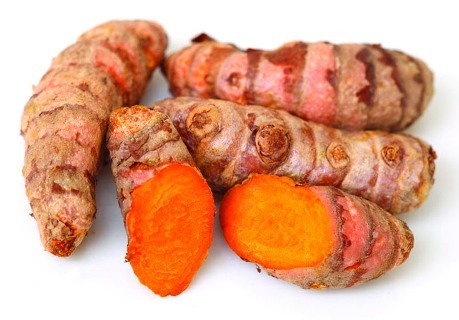 Besides some of the benefits to cure disease, turmeric can also be used to smooth the skin. This is an herb recipes passed down through generations of the kings of the land of Java, Indonesia.